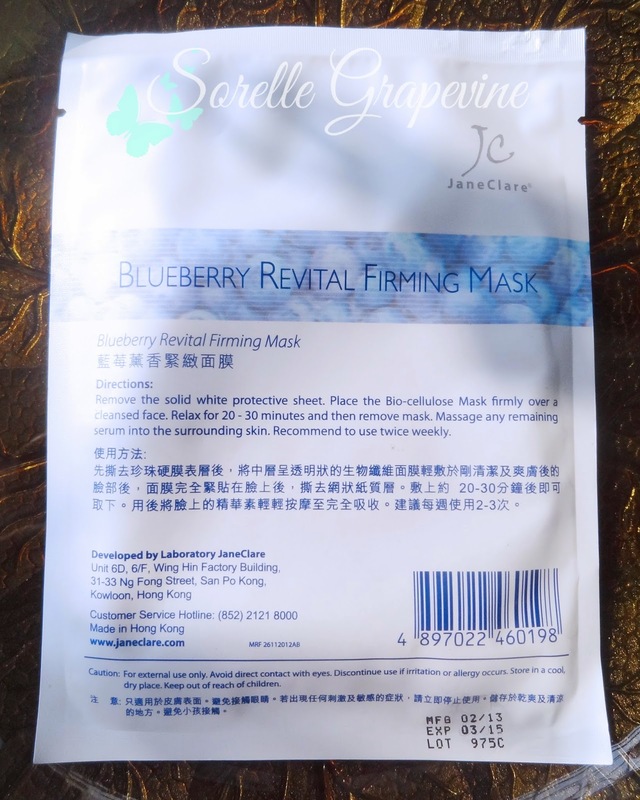 I got a sample of Jane Clare Blueberry Revital Firming Mask sheet in my September Glamabox. 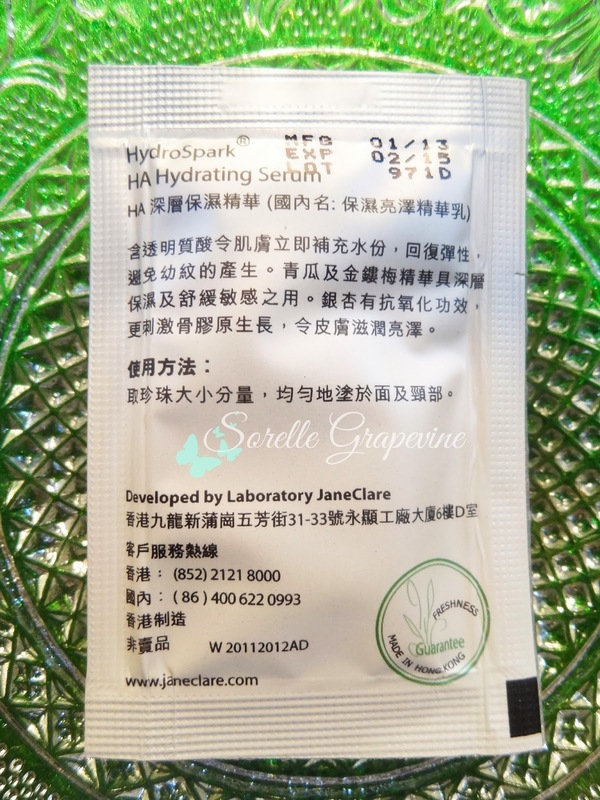 After my not so pleasing experience with the HydroSpark HA Hydrating Serum I really wasn’t expecting anything from this mask. But in the spirit of finally using all the products that I have been stacking and since it provided a quick review option I decided to give it a go (heck I’m all about transparency :D). So did it bowl me over? “Be inspired by the freshest organic blueberries with high antioxidant activity to turn the clock back for free radical-damaged and aging skin. The precious herbal extracts improve the skin’s resilience and firmness. 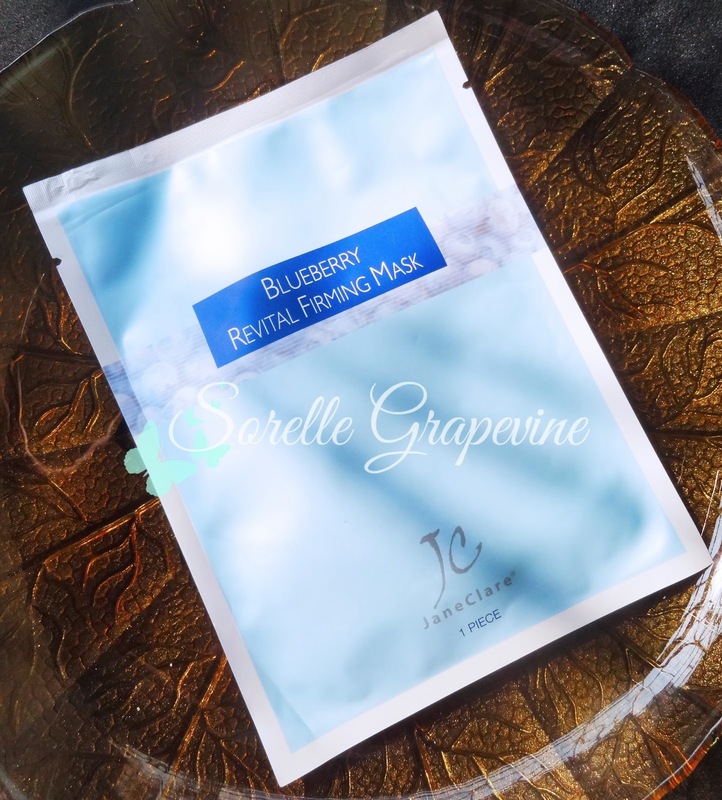 The bio-cellulose mask covers the entire face, including the eyes firmly, and helps the active ingredients being absorbed directly into the skin layers. Vaccinuium Angustifolium (Blueberry) Fruit, Aloe Barbadensis Gel, (Cucumber) Fruit Extract, Angelicae Radix Root Extract, Ginkgo Biloba Leaf Extract, Citrus Paradisi (Grapefruit) Fruit Extract, Lavandula Angustifolia (Lavender) Leaf Extract, Citrus Limon Fruit Distilate, Butyrospermum Parkii (Shea Butter) Oil, Hamamelis Virginiana (Witch Hazel) Fruit Extract. The mask had a lovely light berry smell to it. Usually such types of scents have a sharpness to it that some might find offensive. But this was very nice. The mask itself was quite unique in texture and something that was completely new to me. Smooth jelly rubber like texture only much smoother and softer. They call it Bio – Cellulose material. There was enough serum left in the packet for me to cover both my arms from my finger tips to a couple inches above my elbow and my neck. How to describe the texture? Hmm….Ok don’t get grossed out but to me it actually looked like artificial skin….what one might use for skin grafts. If you are asking how the heck I know that all I can say is that I saw it on Discovery 😛 It has this thinness to it topped off with the feel and smoothness. Really it is quite unique and no not gross at all. It hugs the skin better and feels pretty good on. 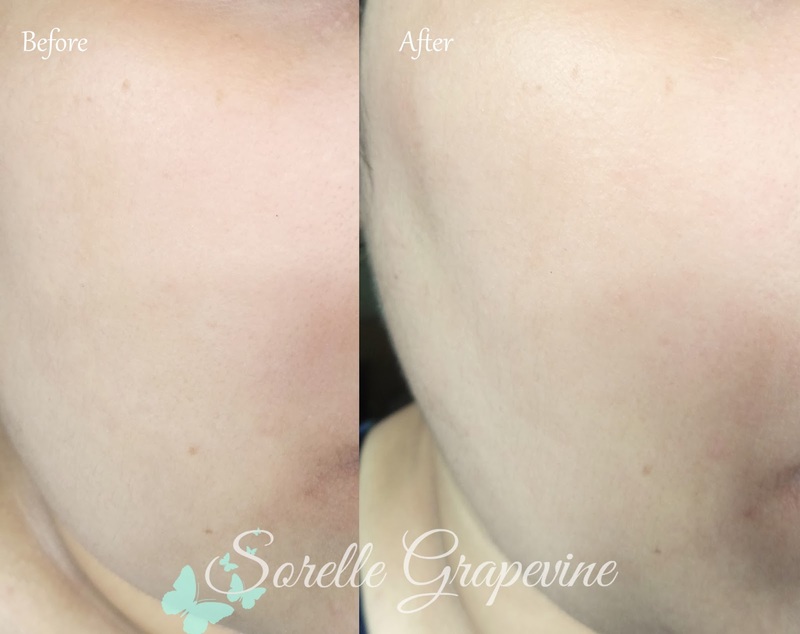 As for the product itself – OMG my skin loved it! It has been literally crying since sometime and all the ineffective products that I have been trying did not help matters one bit. It wanted some love and a lot of moisture. After using this mask my face felt soft and plumped and comfortable. I cant say anything about firmness but it really helped the overall texture and feel of it. And this feeling lasted till the next day. It looked fresh. I lasted a day and half, after using this, without any moisturizer or cream on my face. And you know how I have been lamenting the dryness of my skin since the last few posts. Honestly I loved it to bits! Hello my sweets! 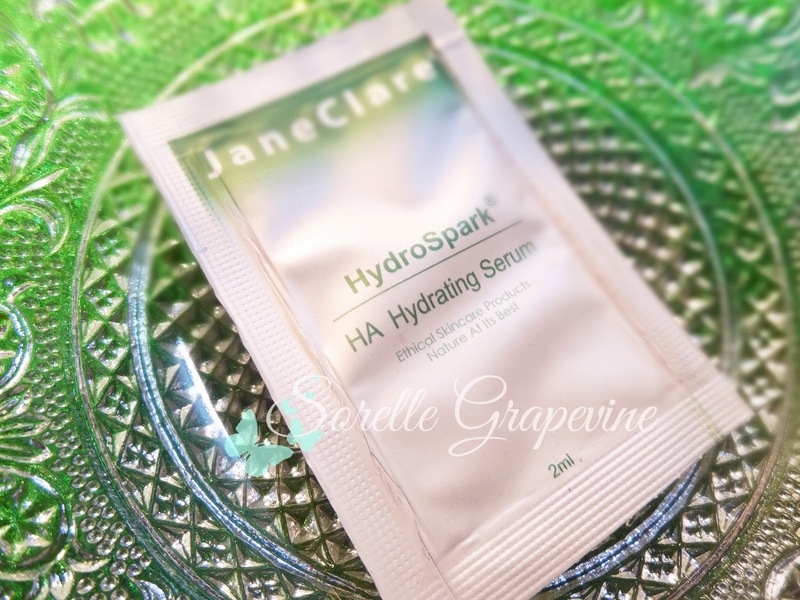 Today I will introduce to a new product all the way from Hong Kong called the Jane Clare HydroSpark HA Hydrating Serum. I got 3 sachets of the stuff in my September Glamabox and finally managed to get myself to use something from all the beauty boxes I have been collecting. Before I get into my experience of it let me introduce the brand to you briefly. Jane Clare is a local Hong Kong brand. Founded by a lady called Angela Lee their mission is to use the formulations perfected and favored by the Imperial family of China and combine it with the high quality natural ingredients available today. Combining Chinese herbal medicines and Western aromatherapy herbs they formulate nutrients with which are able to penetrate the deepest layers of skin. Apart from the skin care line they even have a holistic club as a part of their brand umbrella. Aloe Barbadensis Gel, Panthenol, Ascorbic Acid, Tocopheryl Acetate, Opuntia Dillenii Stem Extract, Cucumis Sativus (Cucumber) Fruit Extract, Ginkgo Biloba Leaf Extract, Citrus Paradisi (Grapefruit) Fruit Extract, Angelicae Radix Root Extract, Rosmarinus Officinalis (Rosemary) Leaf Extract, Rosa Moschata Fruit Extract, Hyaluronic Acid. The serum is very light in texture almost like water. You need very little of it at a time and it covers a large area. 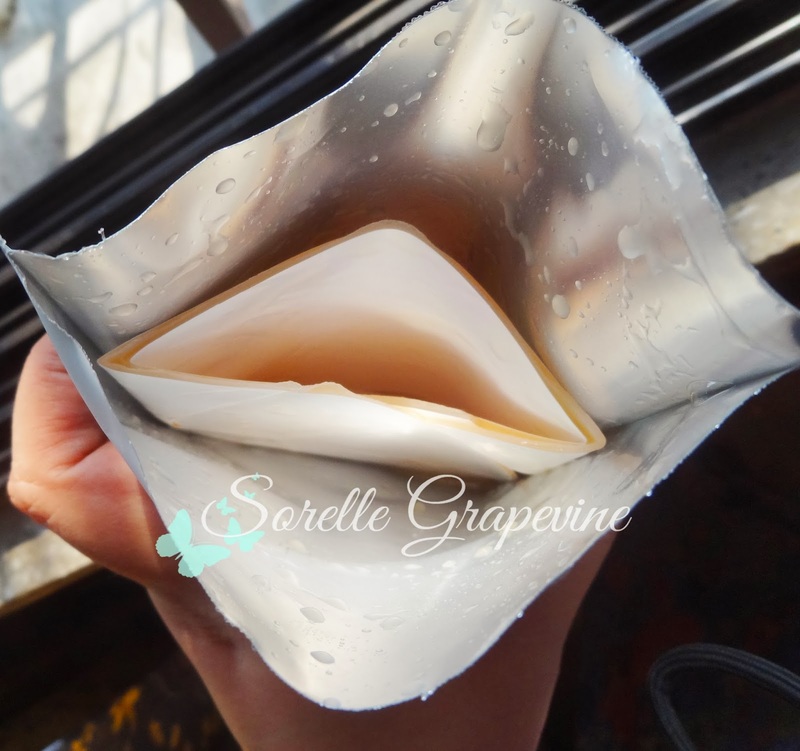 One sachet contained 2 ml of product and I was able to use 6-7 times. It has a very nice fragrance to it which seems a mix of floral and fruity. My usual combination skin was leaning towards dehydration and was in major need of something moisturizing. I didn’t experience any breakout with this and I was using it twice in a day. This should be safe for people with slightly oily skin to use too given the lightness of it. Like I mentioned my was skin was getting quite dry. My cheeks were getting that tug to them along with the slight feeling of discomfort. To test its effectiveness I didnt use my usual moisturizer and just tried this on its own for the first 2 sachets. I got 6-7 uses out of a packet so in 3 I got almost 21 uses which for me was about 10 and half days. Very honestly I thought that it does not do anything. But there in lies the catch. The working of it is so subtle that I caught on only when I gave a break between packet no 2 and 3. My skin was not feeling all plump and wonderful but the dryness had gone and even though I missed the moisturizer the day used to be tolerable. Once I stopped using it I realized the difference it was making. I then used this once a day and added in my moisturizer. The result was much more satisfying. I was getting adequate moisture and there was a smoothness to my skin. Overall given the subtle nature of the stuff I’m still on the fence if I would consider buying the full sized product. It does work to an extent but…the 15 ml sized bottle is supposed to cost HKD 360 (Rs. 2871/- approx) which I feel is a quite a bit considering if you have to keep 2nd guessing whether it is working for you or not. I know I must be confusing you but it is how I feel with it. But I do have another product from this brand and I’m waiting to see how it fares. That is supposed to be a ranked product in its category. So we will see how it goes. For now I bid you adieu!